This PDF 1.4 document has been generated by / iText 4.2.0 by 1T3XT, and has been sent on pdf-archive.com on 02/01/2018 at 18:32, from IP address 31.153.x.x. The current document download page has been viewed 188 times. File size: 2.5 MB (21 pages). sectorization will be discussed in Sect. 1.3.
also have an impact on how hospitals and office-based oncologists cooperate. Especially targeted therapies are currently revolutionizing cancer treatment. of a few cells is needed (Fig. 1). reforms over the last years led to a growing diversification of the outpatient sector. (b) the outpatient system in hospitals. was a steep increase in registrations and costs in this specific ambulatory reimbursement system (Fig. 2). 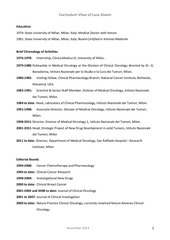 • diseases which require highly specialized diagnostic and therapeutic measures. disease—gastrointestinal tumors—were defined as late as 2014.
characterized by departments in which each unit follows a profession (see Fig. 3). interdisciplinarity. To avoid the conflict of integration and specialization crosssectional structures can be implemented. Especially in cancer treatment the combination of divisional and matrix modules allows an integrative cancer center structure that is essential for multidisciplinary treatment (Lauterbach et al. 2010). 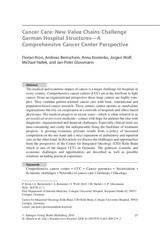 (C), oncology centers (CC) and comprehensive cancer centers (CCC) (Fig. 4). Centers of Excellence in Germany (Fig. 5). health services provided for cancer patients. biomarker diagnostics may be transferable to the treatment of other solid tumors. This file has been shared by a user of PDF Archive. Document ID: 00715908.